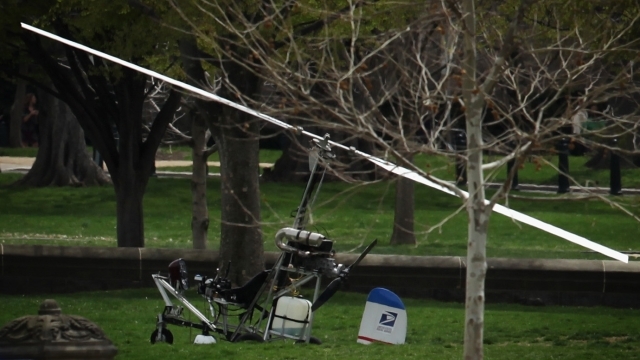 The man who landed a gyrocopter on the lawn of the Capitol building last year narrowly avoided a serious catastrophe, according to prosecutors. A court filing Friday alleges Douglas Hughes, an activist who flew his gyrocopter from Florida to D.C. in order to protest campaign finance laws, came within 1,400 yards of a Delta flight taking off from Reagan National Airport. Prosecutors say a slight deviation in the flight path of either craft could have led to a lethal collision. They want Hughes to serve jail time as a deterrent to any other political protesters contemplating a similar stunt. Hughes agreed to plead guilty to a felony last November, provided prosecutors only asked for a maximum sentence of 10 months. However, his defense argues Hughes shouldn't spend any time in jail since his flight resulted in no injury or property damage. Hughes' sentencing is set for April 13. The judge's decision could affect Hughes' plans to run for Congress; the Democrat wants to challenge Democratic National Committee Chairwoman Debbie Wasserman-Schultz.